Welcome, Baby Maren! Any time now. . .
Today is the due date for my sister, Annika's, first baby. I have never gone over a due date. 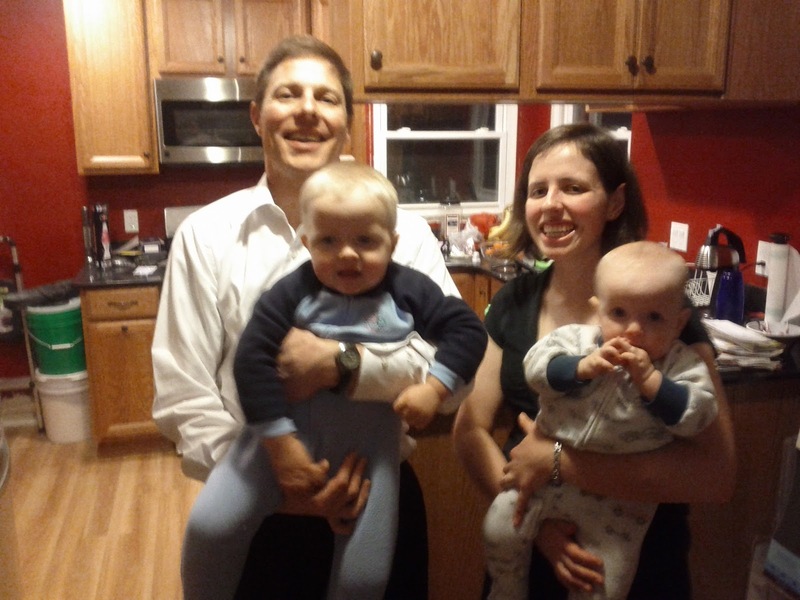 Jared was five days early, and Eloise was one day early. 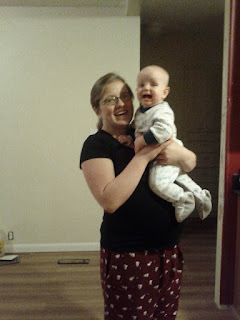 The last few weeks of pregnancy are definitely long enough with that due date looming large in the future. I can't even begin to imagine the strain of having the due date checked off and no baby to snuggle. Come on, already, Baby Maren! I promise you will learn to like it out here. You have a couple of cousins who are very anxious to meet you. Jared, Eloise, and I went to Utah on January 21st to help Anni and Ryan get ready for their new arrival. It was Eloise's first time on an airplane. 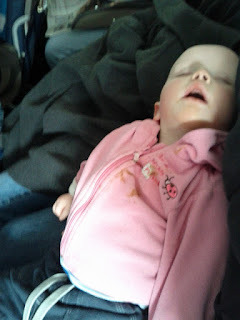 Here is her official first plane ride portrait, complete with airplane cookie all over her jacket. For future reference, giving a baby a cookie on an airplane is a very messy idea. 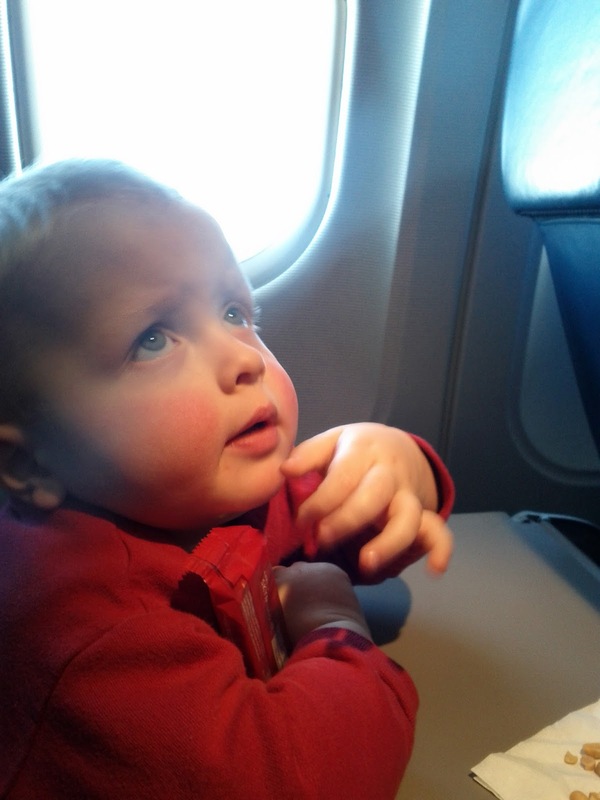 This was also Jared's first time riding on an airplane with his own seat. He was totally fine with that, except for the part where he had to keep his seat belt on. When we arrived in Utah, we made a quick stop at my grandparents' house, but Jared and Eloise had collapsed to sleep as soon as they got in the car, so we didn't wake them up. We hurried up to Logan since we brought the snow storm with us from Seattle. They were having a warm, dry winter until we arrived. You are welcome, Utah. Shortly after we arrived in Logan, Uncle Fred came. 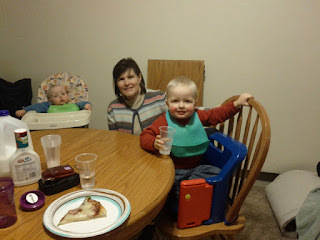 He was in Salt Lake for a work conference, and he managed to find the time to spend Saturday evening and Sunday with us. 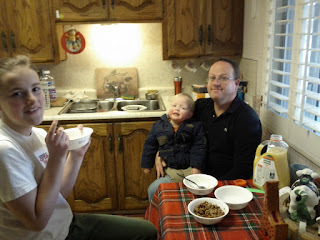 Here we are in the newly remodeled kitchen. We are standing near the front door, for those who haven't seen the remodel yet. 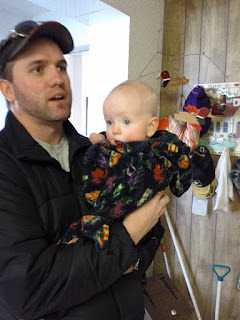 Jared started out a little bit shy around Uncle Fred, but Fred turns out to be very good (read: tireless) at games that a two year old likes, so they were getting along fine in no time. Here they are together sitting on the foot of the reclining portion of the sofa to make themselves fall to the ground. Eloise took significantly longer to warm up to anyone. 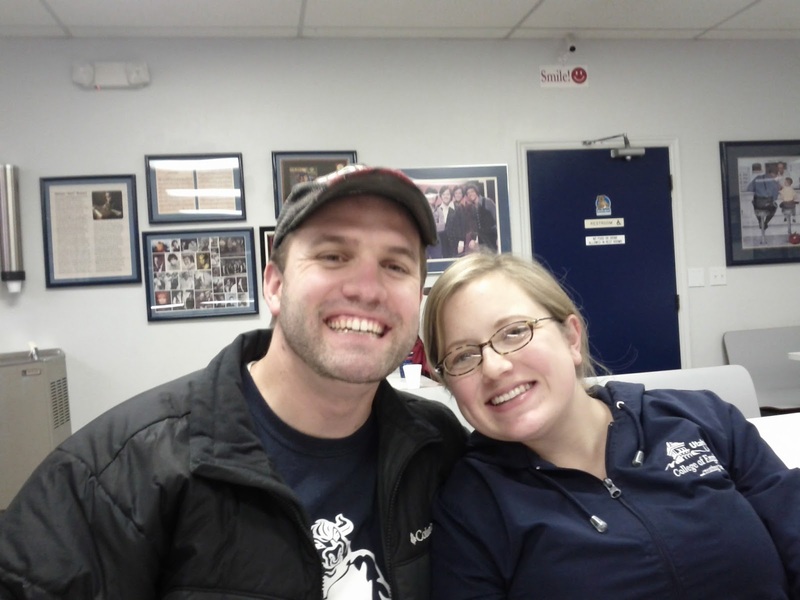 Flying gave her a big bubble in her stomach, and it took her three days to feel normal again. Getting a new tooth our first day in Utah certainly didn't help. She didn't want to be held by anyone except for Mom for a few days. Here she is not loving being held by a very cute, very pregnant Aunt Anni. We got to spend a little time visiting with friends in Utah. Yeon Mi came over to chat and play memory with Jared. Yeon Mi has been my friend since elementary school. I was very excited to learn that Yeon Mi and her husband, Chase, are expecting their own little addition next August. Congratulations! We also got to see Jordanne, but we were so busy going out for Mexican food and having a great time that I forgot to take pictures. Boo. Eloise eventually did warm up to Aunt Anni and Uncle Ryan. I think Anni won her over with a rousing game of chase the flashlight beam. Ryan charmed her by letting her chew on his watch. 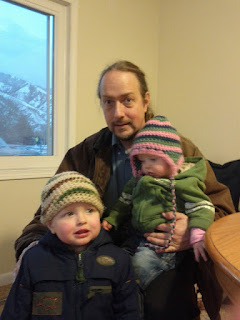 On Thursday we had a visit from Grandpa Michael. He took us out to dinner, and then, when Jared suggested dessert, we went out for ice cream. I love how no one in these pictures is looking the same direction. 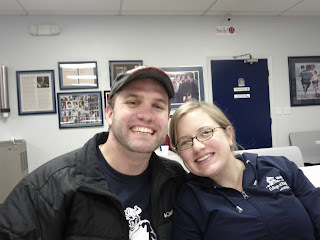 Anni and Ryan enjoying our Logan Charlie's tradition. 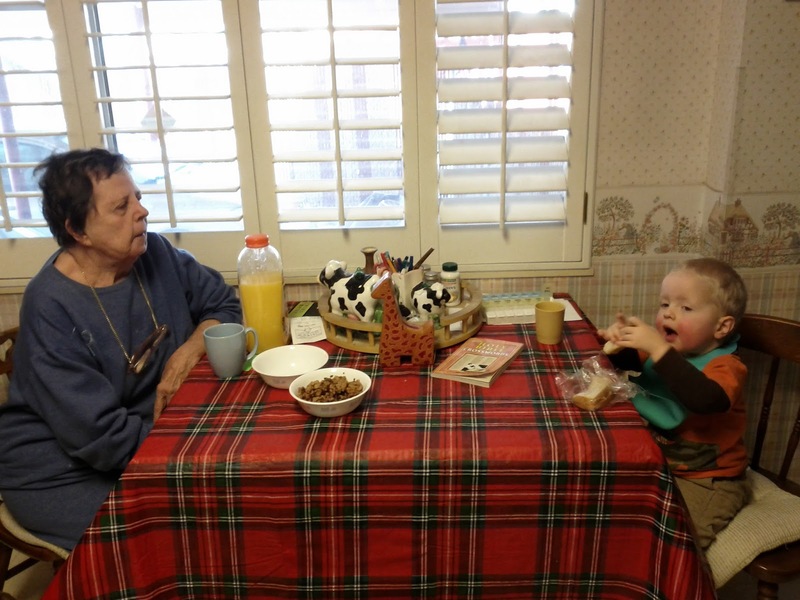 On Friday, Aunt Marie stopped by on her way to Idaho Falls. She brought presents for all of the babies and stayed for dinner. It was great catching up with her. I haven't seen Aunt Marie since Anni's wedding, three months before Jared was born. 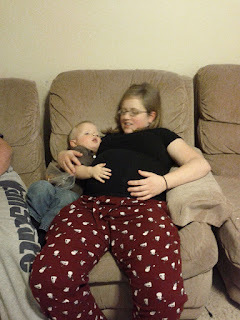 Jared was very interested in Aunt Anni's baby belly. 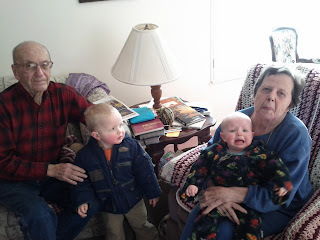 When he learned that his cousin, baby Maren, is in there, he started to give the baby hugs, love pats, and even sing lullabies. 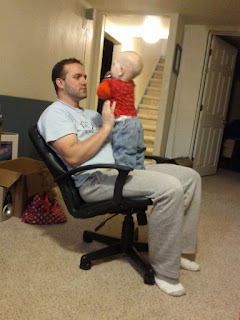 His spontaneous outpourings of affection for his unborn cousin were really sweet. The week went by way too fast. Before we knew it, it was time to head back to the airport and home to Daddy. In spite of our secret hopes, baby Maren was still high, breach, and comfortably curled up inside with no plans to be born anytime soon when we left. 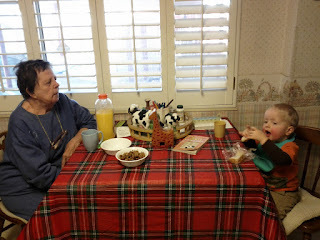 We made a quick stop at my grandparents' house on our way to the airport Saturday morning. 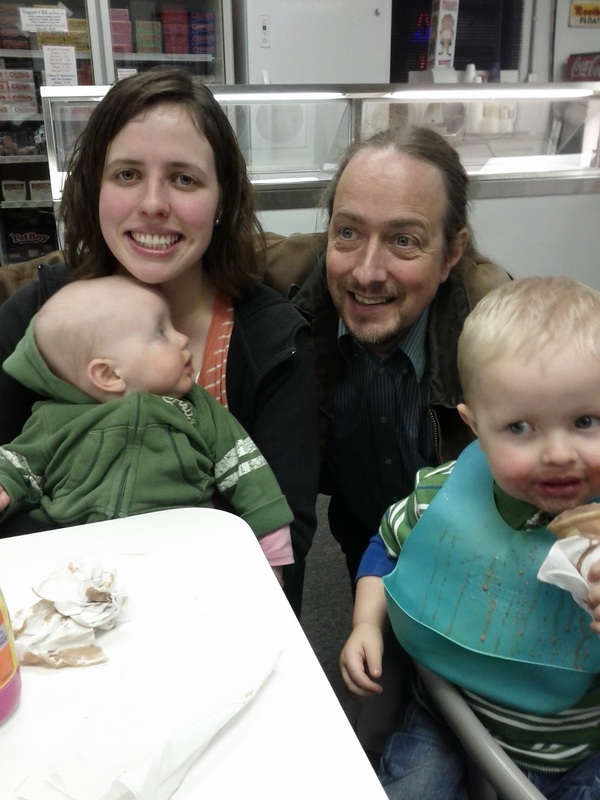 We were surprised to find Uncle Paul, his friend Joy, and my cousin Abby also visiting. 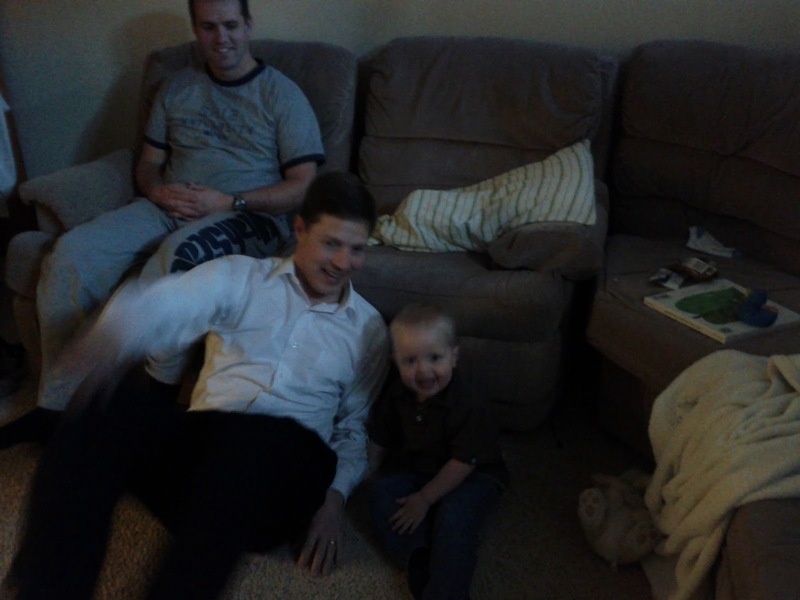 Jared saw that Uncle Paul had juice and climbed right into his lap. He was a little more wary of his great grandparents, although he was happy to take Grandma's cane right out of her hand and run off with it. I think that Eloise is just shy around strangers. By this time, Eloise was perfectly happy to let Uncle Ryan carry her around. This gave me a break before becoming the human jungle gym on a plane for two hours. 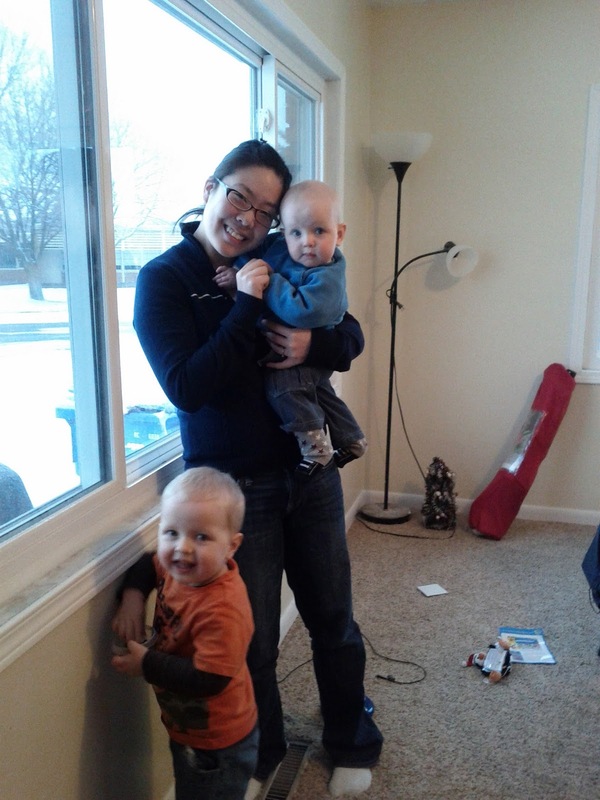 We were happy to get back to Daddy, our new house, and some slightly warmer weather in Washington. Come soon, baby Maren! We are looking forward to seeing your tiny, sweet face. When I posted two weeks ago, we had just gotten a bit of snow. We were expecting the weather to clear up at any moment, or at least warm up and turn to rain. It didn't. What was a fun snowfall for the weekend turned into a week of heavy, heavy snow, and a state of emergency for our unequipped county. By the end of the week, over 200,000 people were without power in the greater Seattle area. We were set to close on our new house on Friday, January 20th, and we had completed all of the paperwork, but county offices were operating on reduced hours, so we didn't have high hopes of our sale being completed on time. Early Friday morning, we woke up to a loud crash as the tree in our front yard dropped several branches on the power line connecting our house to the street power lines. The power surged, blowing out a bunch of light bulbs and doing untold damage to our other appliances that were plugged in before we turned off the breaker. The lines weren't broken, and were obviously still live, but they were on the ground in the front yard. We called the power company to report the situation, but, since there were hundreds of thousands of people without power, a single home was extremely far down the emergency list, even with a live wire in the yard. As the temperature in the house dropped, we put extra layers of clothing on the kids and prayed that we would be able to get the keys to the new house before nightfall. We went to the Bellevue Square Mall just before lunch time to play in the play area and get Greek food for lunch. We were there until around 2, and we still hadn't heard from the power company or our realtor, so we headed home to pack some things for the night and finish packing for our trip to Utah. Jared and Eloise fell asleep in the car, so we went to run some other errands to prolong their nap. While we were in downtown Kirkland, with a light rain falling, we stopped at a traffic light and eight inches of snow crashed from our car roof onto the windshield. I got out to clear the windshield, but when it was cleared, the windshield wipers were no longer working. We drove around the block to a nearby repair shop, where they were closing up for the day early and couldn't help us, so they sprayed our windshield with water repellent and sent us on our way. We stopped to get gas, and then Todd stopped to give his new coat to a homeless man who was standing in 35 degree freezing rain in just a soaking wet sweatshirt. How cool is the man I married? His stopping on this terrible day to give his coat away reminded me of a similar story about George Albert Smith, a modern prophet. By the time we got home it was around 3:30 p.m. and the light outside was failing. We hurried to pack blankets, pillows, food for the evening, and packed suitcases in the car, planning to go looking for a hotel. At 5:00, just as we were putting boots back on the kids to go get in the car and find a place to spend the night, we got a call from our agent saying that we could get the keys to our new house. Since she knew we had no power, she sent another agent who was nearby over to give us the keys right away. The timing was miraculous. It wasn't the way we had planned to move into the new house, but stumbling into a warm house, exhausted from our difficult day, we could not have been more grateful or relieved to have our new home. We warmed up leftovers in the microwave and camped on the floor for the night, with Eloise zipped into a baby tent, and Jared sleeping on a mattress accidentally left by the seller. 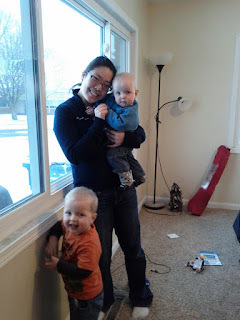 The next day, the kids and I were off on a plane to Utah as refugees of Seattle Snowmaggedon 2012. In the end it took nearly six days for the power to be restored to our rental home. When the power finally did come back on, the furnace was not working for another five days. In that time, Todd moved all of our things into our new house, so all we had to do was go back to clean when we got home from our trip. Here are some pictures Todd took after the snow melted. The branch on "Live wire Louie:"
The house with Todd's rental car in the driveway while the wipers were being fixed on the minivan, and downed branches in the background. Finally, a shot of our front door. This gives a better idea of the amount of debris from the tree. This experience made Jared very aware of electricity. His new favorite game is flipping a light switch, announcing, "Power's on!" He then turns off the light, and says, "Power's out! That light has no electricity!" 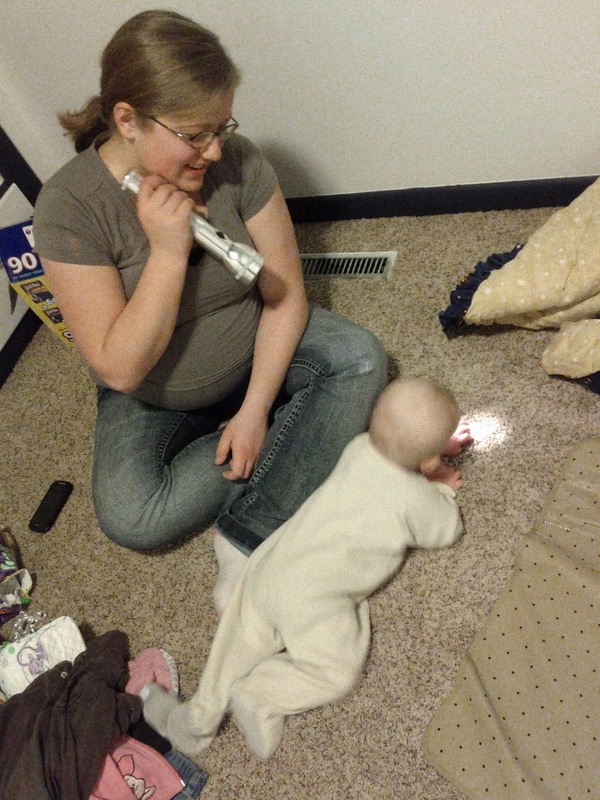 He also stops to inspect every outlet he sees, asking every time to plug something in to test for electricity. My education from this experience has been a new awareness of our need to be self sufficient and prepared for emergencies. I am thankful that we have such ready access to warmth and light, and that everything worked out so smoothly. This catastrophe could have been so much worse.